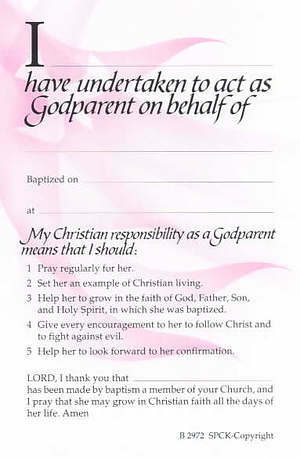 Help godparents understand and take seriously their Christian responsibilities with this attractive certificate. Inlcudes space to personalise with the god-daughters name, their names and where she was christened, baptised or dedicated. Pack of 50 Pink Godparent Cards for a Goddaughter. This is a record of Christian responsibility towards a god-daughter. Includes a declaration and summary of a godparent's duties all set in a classic design. Godparent card for a goddaughter - Pack of 50. Also available in blue for a godson. Pink Godparent Card - Pack of 50 was published by The Society for Promoting Chri in January 1986 and is our 115th best seller. The ISBN for Pink Godparent Card - Pack of 50 is 9780281046072. These cards are lovely keepsakes for godparents, given at the baptism service. 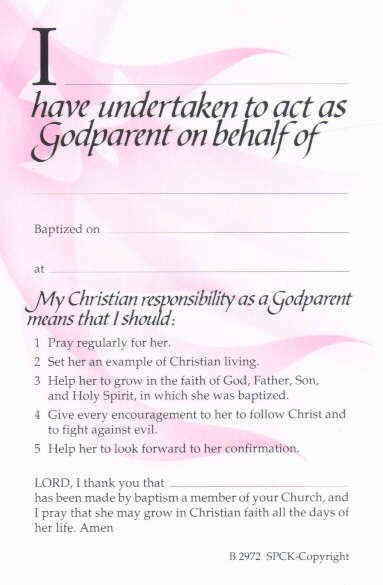 The cards recognise the importance of the role of the godparent and seek to remind the godparent of their responsibility to their god-daughter. The cards are great value for money. Envelopes are not included but the cards are of a standard size and they can be bought separately from any stationer. These cards used to have a slightly shiny finish which meant that they had to be completed using a biro. They are now a matt finish, and you can use the same pen you used to complete the Register, with your fancy registrar's ink ... much better and looks far nicer! Thank you SPCK for changing that! Got a question? No problem! Just click here to ask us about Pink Godparent Card - Pack of 50.